I’ll get to last night’s game in a minute, but first I want to take a look back. Most of you probably know that the Seahawks wore neon-green jerseys (without the matching pants) on one previous occasion in 2009. That game had some extra resonance here at Uni Watch HQ because, as longtime readers may recall, we had run an April Fool’s prank six months earlier, about the Seahawks adding a neon alternate jersey. I actually had very little to do with that prank (in part because my father had been ill in late March and I’d been busy dealing with that). Most of the groundwork had been laid by Phil, who privately solicited prank ideas from a small group of steady readers. Once he chose the Seahawks prank idea, he got reader Paul Soto to execute a very official-looking phony mock-up, and then we arranged for Michael Princip host the mock-up on his now-defunct Seahawks uniform blog, Greenglare, making it look like the design had leaked. My job was to sell the prank, and I guess I did a decent job of it, because a bunch of media outlets swallowed it whole. But it turned out that we outsmarted ourselves. Unbeknownst to us at the time — but as we all found out soon enough — the Seahawks really did have a neon jersey in the works, which they wore for that one game later in the year. Now they’ve taken the idea to its logical conclusion and gone mono-neon. The joke’s on us. As I mentioned, Phil had solicited ideas for the hoax. The guy who submitted the Seahawks idea was longtime reader Jeremy Brahm (shown there at a 2008 Uni Watch gathering in Portland, Oregon). You may know Jeremy as “the only guy who submits volleyball items for the Ticker,” but he’s also a lifelong Seahawks fan. With the team wearing neon again last night for the first time since 2009, I thought it would be fun to have Jeremy weigh in on the proceedings. Here’s his report. As a child, I grew up watching the Seattle Seahawks on television. I had a Seahawks coin bank and taped a “10” on the back of it for my favorite player, quarterback Jim Zorn. Although I now live in Cincinnati, the Seahawks are still my favorite team. In March of 2009, Phil Hecken asked for some ideas for an April Fool’s story on Uni Watch. I sent him the following suggestion: “The Seattle Seahawks will wear green uniforms to see the receivers better in the rain.” I never heard back from Phil, so I figured they weren’t going to use my idea. 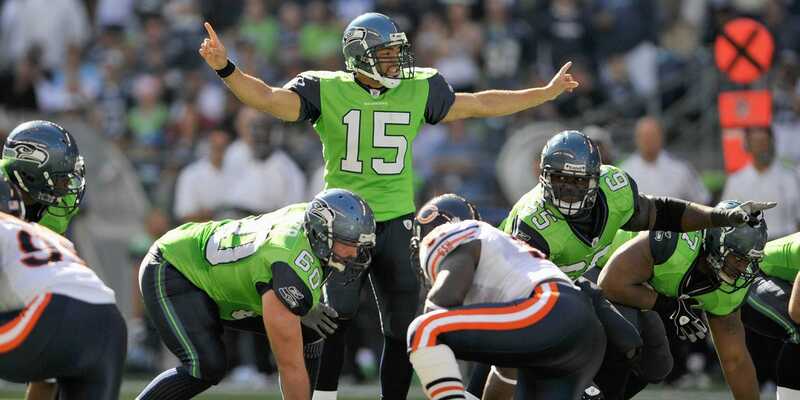 On April 1, Paul published the entry about the Seahawks wearing neon green, which included a link to a mock-up. It looked real. I emailed Phil and said, “Wow, that’s just like the idea I submitted.” He said, “No, that is your idea!” The prank was executed so effectively that it even fooled the person whose idea it was. Prank or no prank, The Seattle Times ran a poll asking readers what they thought. Seventy percent of respondents favored the green. Those fans got what they wanted six months later, when the Seahawks wore green jerseys for one game. As a lifelong fan of the team, I enjoyed feeling like maybe my little joke might have pushed them in that direction. Sadly, they lost to the Bears that day and never wore green again — until last night. Last night’s green was a more intense neon tone than what they wore in 2009. It may not be something that you’d want to see every week, but in the Northwest green is a way of life. From the trees and moss to grapes and apples, or just being eco-friendly, we see it in all its shades. But everyone’s been so busy talking about the green that they haven’t noticed the uniform’s other color. One thing that drove me crazy with this uniform last night was the two different shades of blue — a lighter shade for the chest numbers (which works really well with the green) and a darker shade for the TV numbers and stripes on the chest (which doesn’t work as well). Overall: I like the uniforms — but once a year seems like enough. Thanks, Jeremy — good stuff. My own take: The Seahawks looked ridiculous, but that’s the whole point of the Thursday-night uniform program, so I guess you could say the uniform was a success. Trying to critique it in rational terms doesn’t work, because the design is intentionally irrational. It’s like critiquing a French speaker for not speaking Spanish. In terms of raw aesthetics, the Rams were still the better-looking team last night, because Seattle’s look was so godawful. But the Seahawks actually had the better-executed, more fully integrated design. • The Rams normally wear their primary logo on their nose bumpers. But if you look again at those last two embedded tweets, you’ll see that last night’s bumpers were blank — apparently another retro move to go with the white horns and grey masks. Finally, I’ve written an ESPN piece that takes a broader view of how these uniforms fits into the Seahawks’ and Rams’ respective pasts — and possibly their futures. Check it out here. I don’t recall exactly when that rule was added (anyone..? ), but I do recall that broadcasters initially used the term “unimpeded,” and I always thought that was the correct term. Then someone — I think it was John Madden — began saying “unabated” instead, and soon everyone, including refs, were saying, “unabated to the quarterback.” That version has become so standardized, at least in my mind, that it was almost startling to hear “unimpeded” last night. ”¨So which version is in the rulebook? I never looked it up until last night. The answer can be found in rule 7.4.a, which states, “It is a neutral zone infraction when a defender moves beyond the neutral zone prior to the snap and is parallel to or beyond an offensive lineman, with an unimpeded path to the quarterback or kicker, even though no contact is made by a blocker” (emphasis mine). So there you go — unimpeded, not unabated. Say it right! Raffle reminder: In case you missed it yesterday, the annual Uni Watch year-end reader-appreciation raffle is now underway. Enjoy. • All colors of the latest StripeRite socks are finally in stock and all our back-orders are now shipping (we got seriously screwed over by the mill, which kept bumping us and dealing with larger clients, despite having promised to have everything ready by late November). If you haven’t ordered yet but have been thinking about it, you can do so here. • If you want to get someone a Uni Watch membership card but don’t know which design the lucky recipient wants, you can purchase a gift membership, which the recipient can then redeem at his or her convenience. 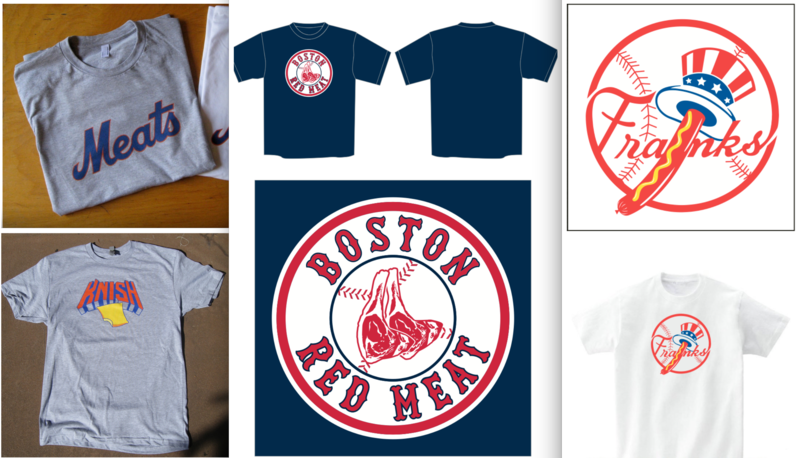 • Just speaking hypothetically here, but if you’re interested in discussing any of these shirt designs, just from a theoretical standpoint, we can talk about that. • Please consider supporting our advertisers, including the Pillbox Bat Company, which makes wonderful painted baseball bats; There Used to Be a Ballpark, which offers spectacular prints showing overhead views of baseball stadiums; SportsTemplates.net, which offers sharp-looking 3-D templates for your uniform concepts; and Rob Ullman, who specializes in pinup-style illustrations of women wearing jerseys. Thanks, and ho-ho-ho to one and all. Baseball News: Here’s something I’ve never seen before: At the 1993 MLB All-Star Game, Mariners P Randy Johnson posed next to NBA star Patrick Ewing — who was wearing a Mets uniform! (Thanks, Mike.) … New camouflage cap for Creighton (from @Padsker). … Here’s a clip from the old TV show Mr. Ed, showing Ed batting against Koufax, Leo Durocher, Johnny Roseboro, Willie Davis, and Moose Skowron. Skowron, interestingly, is wearing the wrong number font on his jersey (from Ferdinand Cesarano). … Hazing rookies by making them dress up as women, which is now banned, once saved a Cleveland rookie from serious injury (thanks, Mike). … People often forget — or maybe just never realized — that Babe Ruth was once a pretty lean machine. That shot’s from his pre-Yanks days with the Red Sox. NFL News: The Jets are playing at home on Saturday, and then the Giants — who play in the same stadium — have a home game on Sunday. That’s not enough time to swap out the end zones, so both teams will go with neutral end zones this weekend, and the NFL logo at midfield. … Here’s a look at the throwback helmet that the Giants will be wearing next Thursday night (thanks, Phil). 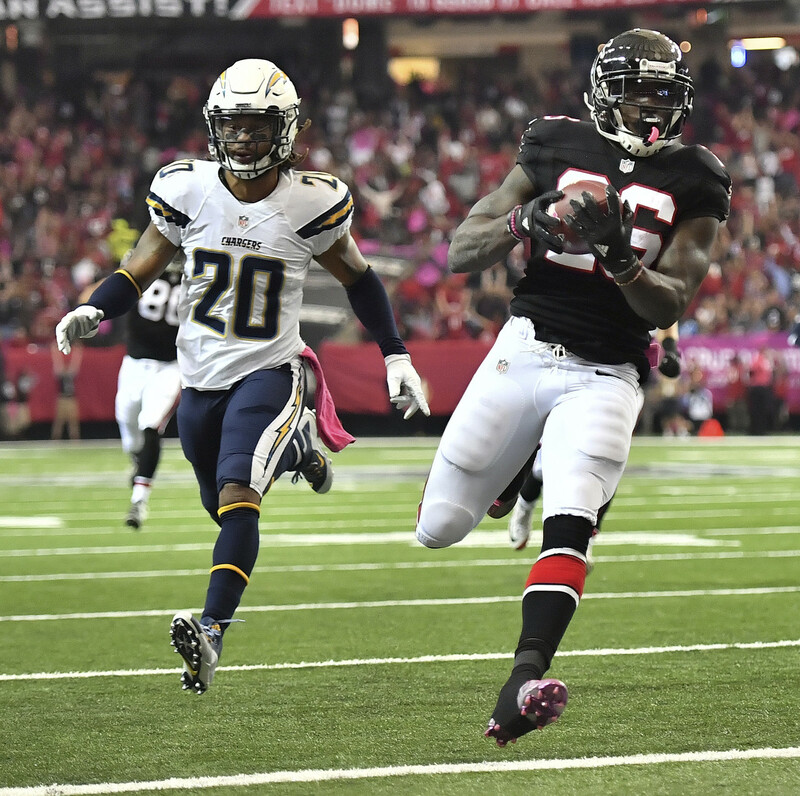 … The Falcons will wear their black fauxbacks this Sunday against the 49ers. That’s the design that debuted earlier this season for a game against the Chargers. … Pats TE Martellus Bennett says players wear less clothing in the cold, instead of bundling up, because it’s sexier (blame Mike). 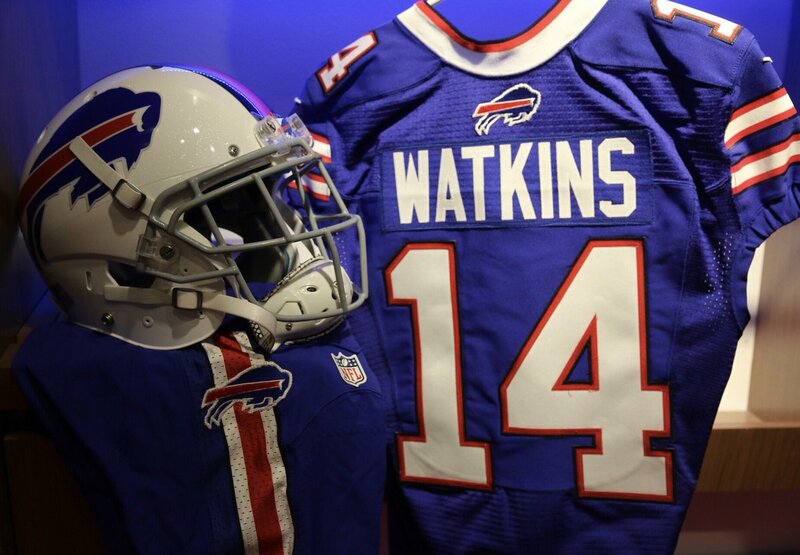 … The Bills are going mono-blue this weekend (from Kenny Saidah). College Football News: Ohio State’s Fiesta Bowl uniforms will be the same ones they wore in the 2015 Sugar Bowl (thanks, Phil). … Appalachian State will wear mono-white for the Camellia Bowl (from @Jon_Ed). … Utah will be going mono-red for the San Francisco Bowl (from Landon Freter). … Eastern Michigan, which is playing in the Bahamas Bowl, is adding a Bahamian flag decal (thanks, Phil). Hockey News: Lots of good stuff in this 1963 Stanley Cup video footage, including scenes of the Leafs and Habs packing up their uniforms, a cool shot of the Detroit Olympia, and a maskless Leafs goalie (from Eli Ganias). … Rocky Balboa tribute jerseys upcoming for the Toledo Walleye. … Fan-designed ugly sweater jerseys tonight for the Sioux Falls Stampede. … No photo, but this story says the ECHL’s Missouri Mavericks will wear “special cancer fighter jerseys” tonight. 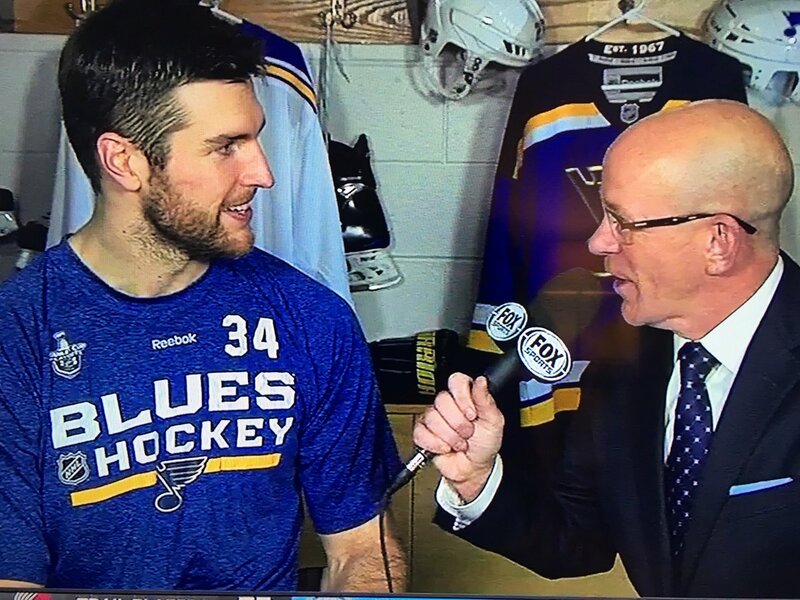 … Blues D Alex Pietrangelo was wearing teammate Jake Allen’s undershirt in last night’s postgame presser. 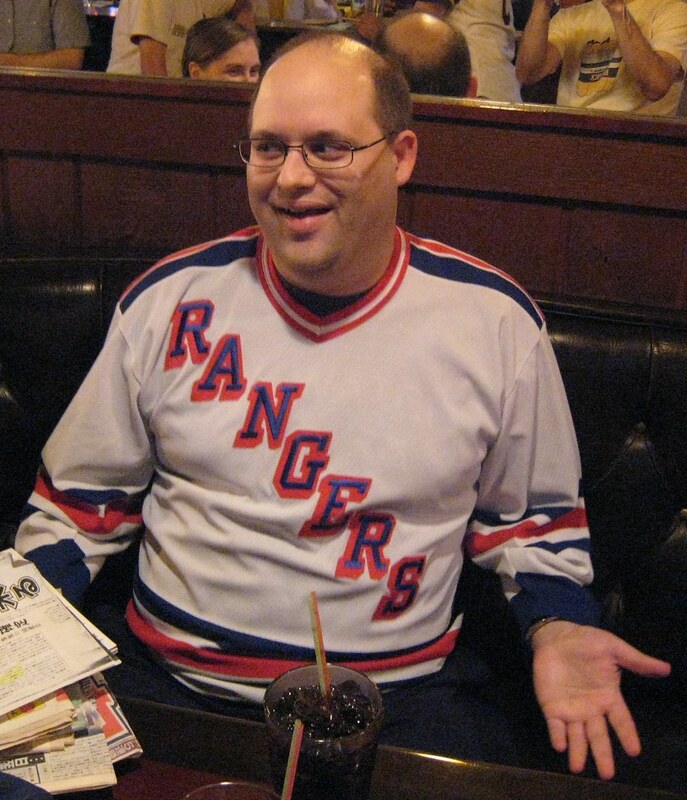 “Darren Pang asked him about it and he said ‘I think it just ended up in my laundry bag and I kept it ever since. Fits well though and that’s all that matters,'” says Thomas Qualls. NBA/D-League/WNBA News: Here’s an an NBA uniform quiz (from Britton Thomas). 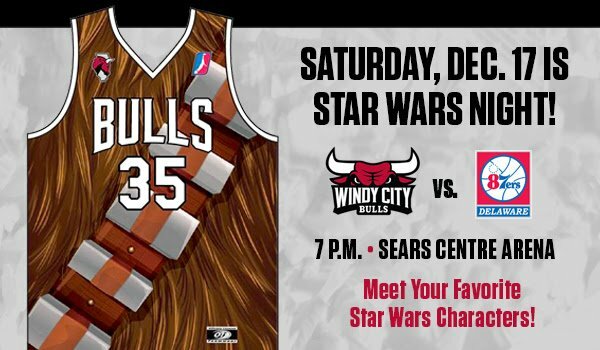 … Star Wars jerseys tomorrow for the D-League’s Windy City Bulls (from Steve Johnston). 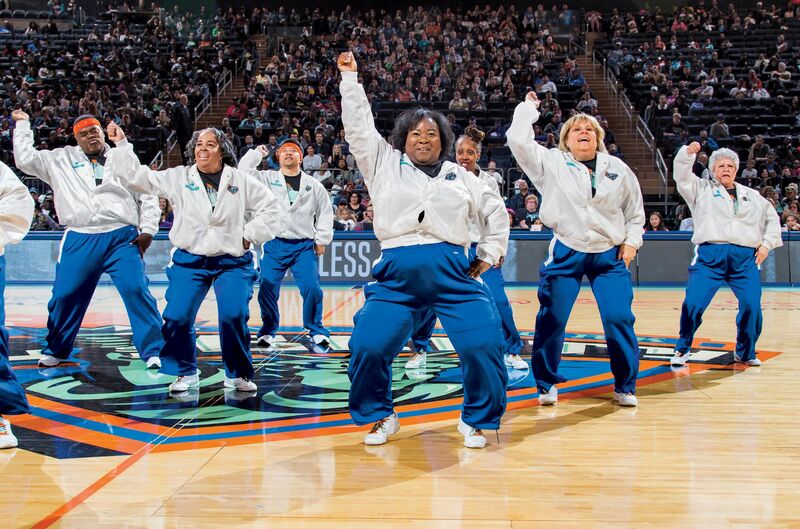 … Here’s something I didn’t know: The New York Liberty’s dancers are all over 40 years old. According to entry No. 16 on this list of reasons to love NYC, the current lineup “is made up of 13 members ranging in age from 40 to 76 and includes a legal assistant, an accountant, a Vietnam veteran, and an IT guy (yes, they take dancers of all genders).” That’s a refreshing change from the usual approach — good for them. 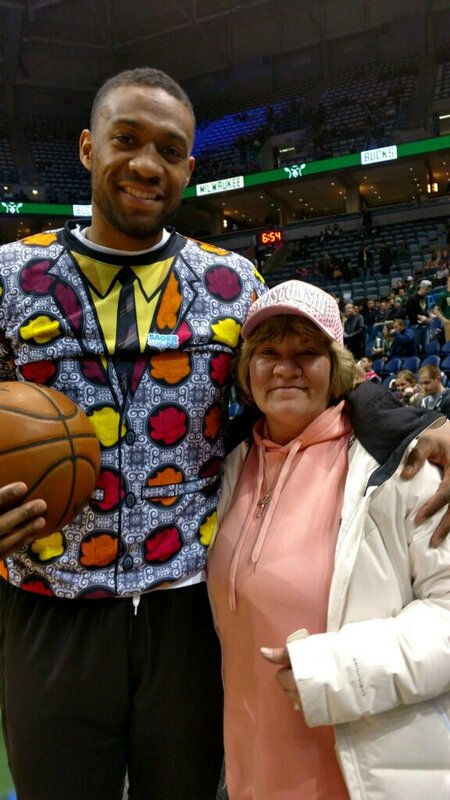 … The Bucks wore Craig Sager warm-ups last night. R.I.P. 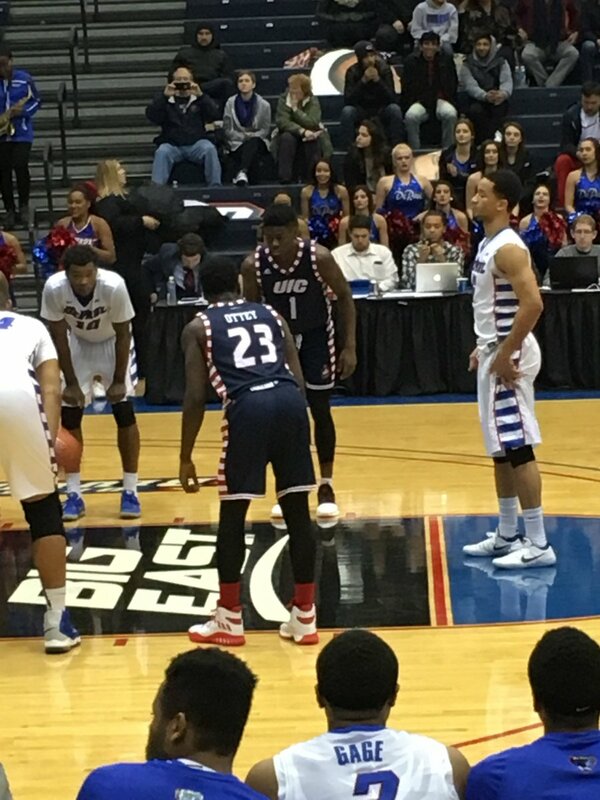 College Hoops News: UIC and DePaul had a candy-striped showdown last night (from Adam Foxman). … UVA will retire Malcolm Brogdon’s number in February. … South Carolina wore red at home last night (from @willchitty4). Soccer News: Southampton will wear a new third kit on Sunday. “This is because they’re playing AFC Bournemouth, whose home shirt is black with red stripes, meaning neither Southampton’s red/white striped home shirt nor their black/grey away kit would be suitable,” says Mark Higgins. “This isn’t the first time Southampton has had to bring out a special third kit due to a kit clash. Also happened against Newcastle in 2015.” … Barcelona’s new home kit has leaked. Grab Bag: When the Dow Jones Industrial Average hit 10,000 for the first time in 1999, there were lots of “Dow 10,000” caps. But with the Dow now flirting with 20,000, caps are in short supply. … New 70th-anniversary logo for Martinsville Speedway (from David Firestone). Shame on me for waiting so long, but the StripeRite socks are unavailable/sold out. Whoa — that happened fast. I didn’t even realize! I’ll check to see when we’ll be restocked. Update: We’re not sold out. American Trench stopped taking pre-orders two weeks ago when we weren’t sure about when the socks were going to arrive. Now that everything’s finally in stock, they’ll reactivate the ordering functionality today. I’ll let you know when that happens, Jon. Thanks Paul!! I have a hard to shop for Bears fan that these are perfect for. I don’t think they paint/repaint the end zones at MetLife; I think they swap out the carpet. The concern is probably that they won’t be able to do it overnight, especially if it snows. That said, I don’t think Jets or Giants fans would mind all that much if the stadium had one Jets end zone and one Giants end zone for a regular-season game. I would mind. I would mind greatly. A Jets end zone has no place at a Giants home game (Barring the traditional split end zones during the pre-season game). Of course a Giants fan would get uppity about this. The seats were red for how many years? I prefer the end zones to say the city name, so that no matter who is playing there, it likely works. It would definitely solve the problem here. “East Rutherford” end zones it is! Average time to swap out each team rugs, and signage is 24 hours. According to tour of stadium. I thought Giants Stadium II had the tray system like they had at Giants Stadium I for the end zones?! According to the tour, they roll up the rug, crushed tires and all. And reinstall like carpet at your house. According to tour. In that Randy Johnson/Patrick Ewing image, Tom Selleck is in the background wearing an Orioles uniform which has my favorite unique uni feature, belt loop pants. Since it was an All-Star game, wonder why he wasn’t in Detroit Tigers garb? The game was in Baltimore, and he participated in a Celebrity Home Run Derby (which he won by hitting one). For what it’s worth, Metlife always has the NFL logo at midfield. Rumor has it that it was supposed to have a removable midfield logo that they could swap Jets/Giants, but Domenik Hixon tore his ACL at the midfield seam and they scrapped that plan. MetLife is the only stadium that does not have the NFL shield on the 25’s. Every other stadium has has home team logo midfield. Bank of America Stadium (Panthers) also has the NFL shield at midfield and team logos at the 25’s. You’re right about the Panthers logo. I do think it is funny that they re still on the 25’s. The tour guide at MetLife was also off on some other facts relating to the team- but was right on all other facts except that one it seems like. I wonder why they have the league shield and not the main logo. MetLife is easy to explain. Gotta be a reason. Asking why the Panthers have the NFL shield at midfield? It’s owner Jerry Richardson’s personal opinion that his team is not bigger than the league, and that the feature presentation is NFL football. Panthers fan here – Mike is correct, Jerry Richardson has always prided himself a “League Man” and has said that the NFL shield will be featured at the Panthers’ 50 yard line. A lot of fans don’t like this, but I think it’s a unique aspect of the field and have gotten used to it. BTW, during the Panthers’ first season, when they played at Clemson, one end zone had the Panthers’ wordmark while the other kept Clemson’s. Even then, the NFL shield was at midfield. What? Where do you get your info? I might be the only one to say this but I liked the Seahawks green uniforms last night. As a once a year thing it is pretty neat looking and very reminiscent of favorite WLAF team, the Orlando Thunder. Nah, I liked Seattle’s uniforms fine. In fact, I think they’re better than the grey ones. The Rams suffered for not having Fearsome Foursome uniforms to match the helmets; uncalled for, since the graphics of that suit are so simple and easy to reproduce. I agree with you – I thought the green jerseys looked great. The all-green look was a little much, but those jerseys are far superior to their grey “dirty laundry” alternates and I think they would look great in the usual rotation, with blue or white pants. I still wasn’t a huge fan of the Seahawks’ look, but I was surprised just how much I hated the Rams white horns on the field. By the pictures and seeing the helmet by itself, I thought it would look at least as good as the yellow horns. But, boy, it just failed to pop at all. At first I thought maybe it was the mismatched shoulders, but I don’t think that’s the case. I really think those helmets just don’t work on the field. The Seahawks look was dope, however I feel like it would look better with the blue pants. However, I feel like it should become permanent alternate, as I can hardly tell the difference between the greys and the whites. Excluding Falcons non-throwback games since 2003, last night was the worst looking NFL game known to me. Southampton won’t sell any of their third kit to the public bit will raffle off one to a season ticket holder. Talk about a collectors item. That looks WAY better, but after seeing this I definitely think they should go back to the royal blue and yellow color scheme. It’s not you. I wrote that exact same thing. I thought the same thing. Losing the gold would have helped the set overall and especially up-close. From a distance I thought they looked pretty good (though a blue stripe on the pants would have looked better). Seahawks green reminded me of tennis balls. Rams should outline white horns with gold on blue helmets. It reminds me of that green body stocking dude in Philly. Doing an April Fools gag about sports uniforms these days has the same problem that doing a Donald Trump or Sarah Palin impression does. The real thing is so much funnier than the joke can ever be. True story: When the Yanks were getting set to move into their new stadium in 2008, my ESPN editors and I planned a April Fool’s prank in which I would write an ESPN piece saying that the Yankees would mark their move to the new ballpark by adding NOBs. We had it all set to go — and then higher-ups killed it. Nobody really pays any attention to the Cleveland Browns (which at this point no one should) but I am curious to know if they’ve broken the record or are close to achieving the record of most uniform combinations in one NFL season? This sunday they’re re-wearing what they wore in their home opener (White tops, brown pants, orange socks) and they’ve also worn all white with orange socks twice. With that being said, this will still be their 12th uni-combo in their 14th game with (I’m guessing) for sure a 13th in their last home game (I would presume it will be brown jerseys over white pants with brown socks) and potentially a 14th against Pittsburgh Week 17 if they choose to go white tops, brown pants, brown socks. Browns fans don’t get to bask in the glory of a single win on the scoreboard, but maybe we can celebrate breaking a different record. Paul is spot on. The Seahawks looked ridiculous. I feel like last nights Seahawks uniform will go down in histrory as possibly the most laughable uni combo ever. We’ve crossed the line (ok,we probably crossed it a few year ago) into uniform insanity. My God whatever happened to the NFL? Younger person here. Everyone I talked to today like the neon look. I STILL say the neon green wouldn’t be bad (or as bad) if they would JUST pair it with white pants. Wearing them with dark blue (in 09) or going all green last is too much. A white pant would subdue the effect of the neon shade – but hey, whatever right? I’m in complete agreement here, Randy. In my dream world however, I like the chaos, but not a huge fan of monochromatic uniforms; If the NFL insists on TNF, why not let teams do WHATEVER they want for one alternate uniform that doesn’t count against their twice-a-season alternate tops. So each season, once the TNF schedule is out, teams would then design their “thursday” uniforms (16 teams presumably would have to design a road uniform, but that’s still fine, to me anyway), and I think we would see some cool results. Rather than making teams wear the same color from jugular to tippy toe, let them do whatever! Then last night, the Seahawks could’ve been neon green on white (which I would have preferred). 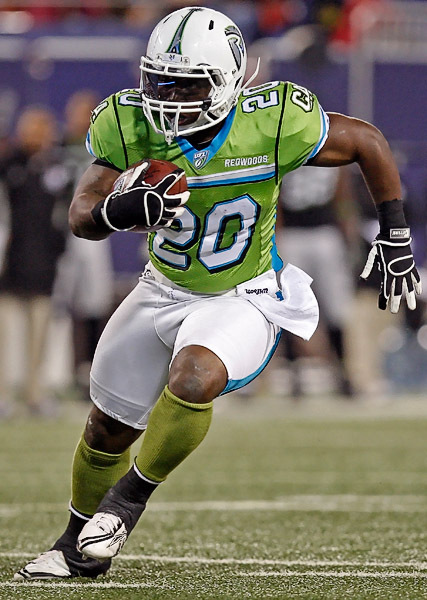 If the Seahawks would have gone with white pants and the neon green jerseys, they’d invite even further comparisons with the old Orlando Thunder. I guess it’s time to ask who wore the neon better: Orlando (WLAF) or Seattle (NFL)? Thanks for the reminder that the Orlando Thunder were part of the WLAF. I frequently get them confused with the CFL’s U.S. expansion teams. Easy to do, since they existed around the same time and the uniforms were equally atrocious. I think even the grey or blue pants would have looked good with the neon jersey. I much prefer the neon look to the Jags. I think it would look fine once or twice a year as long as they don’t do the leotard look. The Seahawks are a perfect example that sometimes more modern concepts work. Their uniform reminds me of the innovative and unique way Pete Carroll approaches the game and coaching, and the way their roster is built. I think their uniform perfectly represents their team. I also have a confession to make. I’m a Cowboys fan and have been looking at the Bucs this week, and I actually kinda like their new look. The colors used are great, if they would have just done something better with the pants stripe and number font it would be one of the best looking uni sets in the league. I absolutely loved the Orlando Thunder uniforms so I couldn’t wait to see the Seahawks wearing neon green. This was by far the best colour rush uniform in my opinion, loved it. Took me 20 years to track down a Thunder Jersey on eBay! Unimpeded did sound strange. For what it’s worth the NCAA rule book does not include either term. I always announce unabated. wouldn’t it be cooler if the endzone’s this weekend just said “New York” in block letters? wouldn’t that work for both teams? maybe one in green, one in blue or soemthing? seems better than that old timey junk. if you’re going old timey, do argyle. I still don’t understand why you people hate bright colors. The Seahawks looked fine, other than the sock issue that has ruined all of the color rush uniforms. Jeff, could you explain the sock issue you’re referring to? What kind of socks would you have preferred? By sock issue, I mean the lack of contrasting socks. I do believe I’ve complained about that most weeks, actually. It’s the 2nd biggest problem with the whole Color Rush promotion. Even the teams that looked relatively good like Denver would’ve looked better with normal blue/white socks instead of orange all the way down. Seattle should’ve had navy socks, the Cowboys blue, the Panthers black, ect, etc. I agree that contrasting socks would be better, but that seems like a complaint about the very nature of Color Rash. The whole point is to eliminate contrast as much as possible and for the players to look like they’ve been dipped in a vat of colored dye (or, more likely, colored superhero serum or some such). Hence the matching shoes. And you know they’d have matching helmets if they could. It’s essentially a bodysuit aesthetic, no? that seems like a complaint about the very nature of Color Rash. I suppose it is. They could have given us a weekly color vs color game with a line of decent-to-good uniforms… and instead we got this. When they first teased the idea of it before last season I was looking forward to it… and I’m just disappointed with the whole thing. They went to all that trouble to peel off those very large decals and reapply new ones but kept the same garbage jerseys? Garbage team doing garbage things for a garbage game. Unimpeded is clearly the right term. Unabated makes no sense. The key is the last part of the rule – the part you didn’t reproduce above – “officials are to blow their whistles immediately”. Ordinarily, the whistle isn’t blown on an offside, the offence gets a free play. Where the defender is UNIMPEDED, however, the whistle is blown to protect the quarterback / kicker. “Unabated” makes no sense in that context. There was a play a few weeks ago where this came up – where Richard Sherman who just about killed a kicker. The refs and the announcers muddled around for a while with “unimpeded” and “unabated” but never got to mentioning the point of the rule, which is that the ref was supposed to blow the whistle immediately to protect the kicker. The word “immediately” is right there in the rule. Its a pet peeve of mine that the refs are getting later and later with the whistles at the end of plays and in circumstances like this (unimpeded) the players have know way of knowing if the play is still live. Seeing as how the Seahawks made walking green screens of themselves last night, I live in hope that an enterprising video savant will come up with some quality .GIFs exploiting that technology. The big story will be the Seahawks, but to me, it was the Rams. When I saw photo recently of the blue and white helmet, I thought it looked awesome. Seeing it with the current uniforms, though, made it appear ridiculous. Two totally mish-mashing uniform elements (I guess it was the opposite of the word “uniform”). Not a fan. If you’re going to do it, do it right. I just wish the Rams would have had the foresight to change back to the royal blue and yellow uniforms for the 2016 season. Everyone was projecting that they would move back to LA by that time. Even if it hadn’t work out, those colors were still beloved in St. Louis (and the Rams won the Super Bowl wearing that uniform in St. Louis during the 1999 season). To change the uniforms at the time of the new stadium opening is BS. The bigger event was the team relocating to LA. Give them the colors they deserve, and make the blue and white uniform a throwback. The franchise seriously botched this attempt and I disagree with it on every level. And by “every level” I mean from an aesthetic standpoint, community building standpoint, nostaglia, and yes, even marketing. The bigger event is “team finally moves (back) to LA, LA’s historic franchise” not “team opens new stadium.” So even if you try to explain it in a corporate marketing sense, it is more sensible for them to have changed uniforms for 2016. Cut the BS and do it for 2017. What a joke. Additionally, on TV and social media the Rams are constantly represented by different colors now. You see them with royal blue and yellow, white blue, and their official navy blue/gold. It’s like they are trying to go back to the previous brand colors, but not officially doing so. So it’s just a mix of everything and has become ridiculous. As to last night’s game; the NFL can now officially stop wondering why viewership is down. There are several reasons but the Seahawks uni tied a bow on top of all of them. It was embarrassing and unwatchable. While the white Rams horns didn’t match well with the rest of last night’s uni, it did look great on its’ own. I would love it if the Rams went back to the George Allen era blue and whites. Anyone have an idea where that Babe Ruth picture was taken? StripeRite ordering functionality has been restored. I liked the all neon green look – as a silly one-off. Would love to see an orange team do the same with the same day-glow effect. Maybe the Bengals, as they don’t have anything to lose, uniform-wise. Okay, not as fluorescent. But still mono-orange! I’m definitely referring to neon/dayglo/fluorescent, not regular all orange as several teams have done. I just bought the perfect Christmas gift from them because of your link. Thanks! Awesome. Thanks for supporting one of our advertisers! It was the $60 double print of all the ballparks. Someone I know is really going to like it. A very nice gift. …and for the record, I really liked the Seahawks uniform on TNF. It’s different and represents Seattle well. Although I would love to see them in some throwback uni’s from the 80’s/90’s. I thought the Rams uniforms were dull. Maybe the white horn has some historical significance, but it seems out of place on a all-white uniform. I heard there was plans for an all yellow or gold uniform, but that got scrapped when it known that the Seahawks were going with Neon green. They wore all yellow last season, that’s probably what you’re thinking of. Like I said in yesterday’s comments, they should’ve worn their throwback blue & yellow jerseys with blue pants. That would’ve been far better than the throwback blue/white helmet on top of the modern uniform. I can’t believe they did that intentionally. It’s a uniform combination you’d get in Madden if you accidentally hit a button too fast or something, not something you’d actually want to wear. Just a few years ago I believed that the NFL would never see the outlandishness that we’ve witnessed in college football. I think we are getting close with Thursday Night Football, some recent uniform designs (like the Browns, Bucs, Jags), and nonsense combinations like the Rams wearing white horns 1960s horns with a 2000s uniform. I know many will disagree with me, but I actually think the Seahawks jerseys last night were sharp. The monochrome neon looked terrible, but pairing those with the Grey pants would be a nice alternate look two times a year. As for the Rams, it almost seemed to me that the white horns were a late idea, hence the uniforms retaining the gold elements. Any way to confirm? Either way, I think they should go back to Royal Blue and Yellow. As for the Rams, it almost seemed to me that the white horns were a late idea, hence the uniforms retaining the gold elements. I think that is precisely the case. Pillbox Bat company, “painted pats”. For all the complaining we do about the Color Rash (guilty), they at least brought back updates of two of my all-time favorite unis. You’re right — they should’ve gone full Fearsome Foursome with the Rams last night, and I wouldn’t mind at all if they did that a regular-season uni. (Either that, or gold-trimmed white horns and an updated ’64-71 with gold trim on the numbers. And the gold-on-blue-striped pants do look good.) And the Saints a couple weeks ago: The home ’67-68 white jerseys with the gold numbers are my all-time faves, and it was great to see them again — and they looked much, much better with white pants and gold-on-black-striped pants. Bring back the original fleur-de-lis, and the original shiny gold helmets and ditch the old gold, and it’ll be an all-time winner. In Pittsburgh, the Steelers and Pitt Panthers share Heinz field. During the college season, one end zone reads PITTSBURGH while the other uses the “neutral” stripe pattern. When the Panthers’ season is over, the change the other end zone to the Steelers’ word mark. Now, I understand it’s a grass field and they don’t want to repaint “Panthers” and “Steelers” over and over. But why not just have “Pittsburgh” in both end zones? The one neutral end zone looks ridiculous. Perhaps so there’s no “ghosted” Pittsburgh under “Steelers” after college season when it’s switched? Perhaps. But you gotta admit, having one end zone “blank” for most of the season is really weird. Especially when both the pro and college teams share the city name. I believe that the Miami Dolphins and Hurricanes both go with a white “MIAMI” in their end zones during the shared season, which looks better and makes rational sense as a compromise. FWIW, Paul, assuming you’ve not already covered this at some point, an interesting idea for a column would be a look at the history of painted end zones in football, like who were the first college/pro teams to get the idea to do put names/logos in the end zones, who were the last teams to hold out (I can remember the Bengals were the last NFL team to have plain end zones), how college/pro teams that share stadiums have dealt with issue, what goes into painting/erasing end zone designs, stuff like that. I love this idea. Please pursue it! Especially as it relates to the NFL. Thursday’s “color rush” night is meant to wake up players who’ve only had four days to rest. Seahawks look like mobile popsicles.